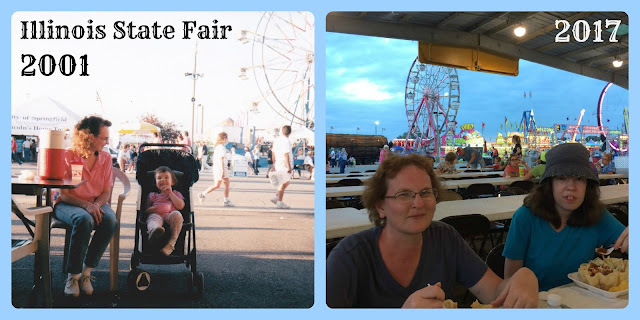 Last week, we spent EL's birthday at the Illinois State Fair. The last time we were there was 16 years ago, on her 3rd birthday, so I thought it would be fun to post a picture of EL and me 16 years ago in 2001, and then again in 2017. It looks like we were basically sitting in the same place for the pictures. Were were in the food-a-rama, which is the big area inside the fair where you can find many different food vendors, and lots of tables under one roof. In the background is the Ferris Wheel in both pictures. 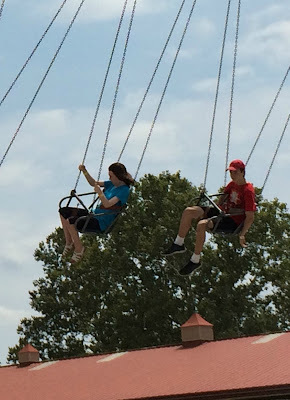 During our time at the fair, we saw several short stunt shows, looked at the exhibits, ate expensive food, drank lots of water and lemonade, went to a "Herman's Hermits" concert and, of course, the kids went on rides. Out of the whole fair experience, I think the kids enjoyed the rides the best. There was one ride (see photo above) where they sat in a car and went backwards in a fast circle. They both loved it and went on it several times. They also enjoyed the swings (photo below) and went on that ride several times as well. For most of the rides, the kids boarded together, although there were times when they separated, like when JJ went on the big swinging boat while EL chose the milder Carousel. Thankfully, the lines were not too long while we were there, so the kids were definitely able to get their money's worth out of the rides. After a long, 12-hour day at the fair, we walked out exhausted and ready for bed; but it was a good kind of exhaustion, as we all enjoyed getting away and spending time together as a family. As I look again at the picture of 3-year-old EL, it makes me realize how our lives have changed since then, and how fast the time has gone. Soon, JJ will also be grown and making a life of his own; so, times like these with our children are always cherished times. Exhausted or not, it was definitely a trip worth taking.